We love to interact with our customers! They really help us dial in and get to know our product. Many of our customers are gluten free savvy, and have been experimenting with gluten free flours for several years. However, most customers who reach out to us are new to the gluten free scene and need a tutorial. They have several questions about the best way to replace all-purpose wheat flour with Flour Farm Organic Gluten Free Flour Blend. So, we thought we would make it easy and provide a cheat sheet! BTW: It is important to note here at the beginning that this guide is for an all-purpose, wheat flour swap out. 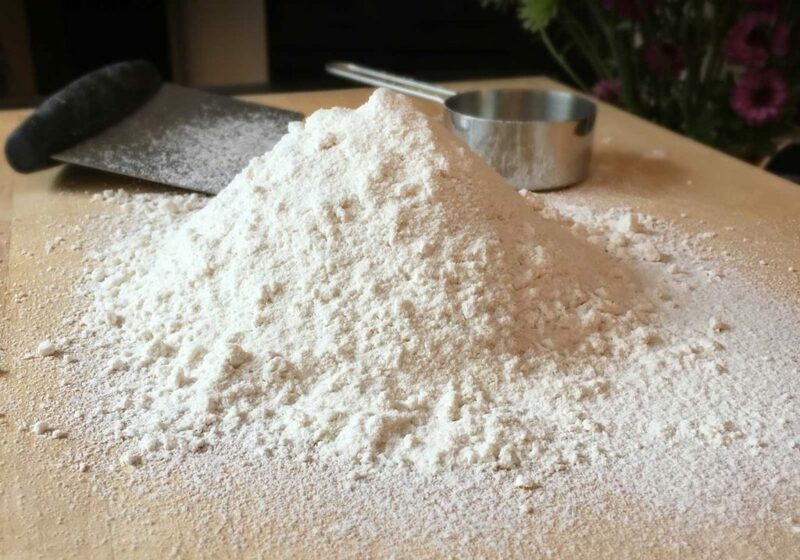 If you need advice on how to replace a gluten free flour with Flour Farm, please contact us as other gluten free flours contain ingredients that we do not have. The good news is that gluten free swap outs do not need a past life regression with Einstein to create a success story. The challenge – gluten free, chemically speaking, is not the same as gluten. Hence the word, “free.” Gluten proteins are unique. They provide their own stretch, structure, and texture characteristics. They act in a way that no flour without gluten can behave. Trying to mimic that behavior can stump the best of us. However, we can get close in a clean, organic, and nutritious way. Enter Flour Farm! Flour Farm Organic Gluten Free Flour Blend contains only five ingredients: sweet white rice flour, brown rice flour, tapioca flour, coconut flour and almond flour. That’s it! Click on each photo to be directed to our main recipe page. Step one, you must have a delicious, gluten-based recipe. You can not successfully swap out flours if the original recipe stinks. Period. The next step, view our complete measurement guide, which you can access by clicking on the link. We use this guide every time we adapt a recipe to make our lives easier, and to avoid mistakes. Third, invest in a kitchen scale. Accurate measuring makes gluten free baking easier, and creates less waste. 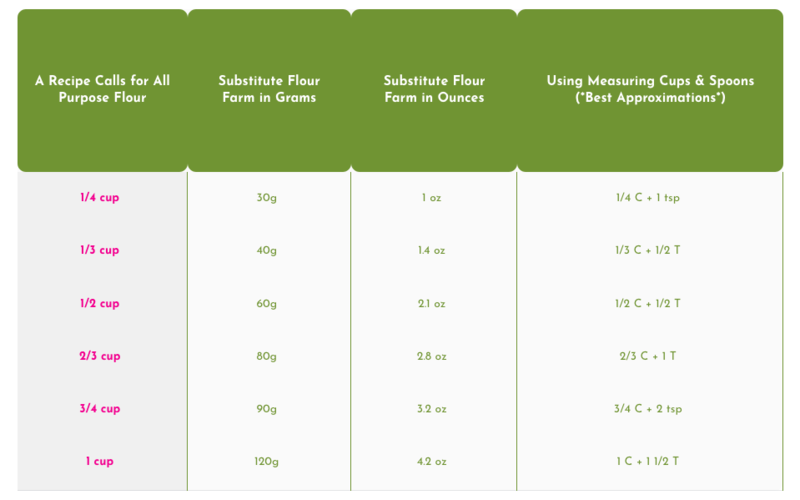 Finally, know your gluten free flour blend. Does it contain gums, starches, leavening and/or sugar? The percentages of these ingredients can vary by blend and change your recipe drastically. Flour Farm does not contain any gums, extra starches, sugar, dairy, or leavening so that you can control the amount you need for each individual recipe. BONUS! 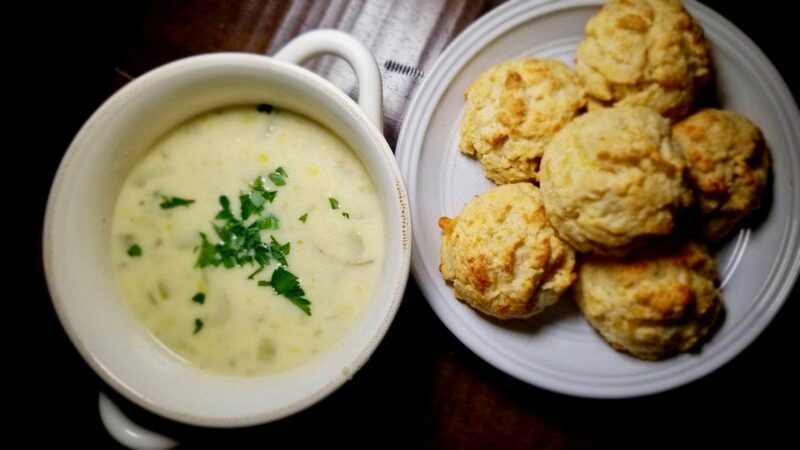 In order to obtain the rise, flavor, texture, etc of gluten containing products, we play with leavening, fats and sometimes gums to make delicious gluten free food. How we do this varies on the type of product that we want to make. Not every baked good needs gum added, such as xanthan gum. There are some recipes that you can swap out 1:1 with Flour Farm, and others – don’t even think about it. Use the product descriptions below to assist you. Typically, you can switch out all-purpose flour and use Flour Farm for these types of products 1:1. We prefer Flour Farm as a thickener to arrowroot, cornstarch, or tapioca flour. The flavor profile that Flour Farm provides compared to these starches tastes superior in our opinion. Making gluten free bread is both an art and a science. The presence of coconut and almond flours in Flour Farm offer a unique, but tasty, baking perspective. Therefore, a 1:1 Flour Farm replacement works with neither yeast, nor sour dough breads. Yeast and sour dough breads require gums and/or additional fiber for rise, texture, elasticity, and structural support. We have discovered that a combination of xanthan gum and guar gum are best, as they work synergistically to provide an excellent bread product. Also, the percentage of gums in our bread recipes varies from 1% to 2.5% depending on the type of bread. For example, sandwich bread recipes require a higher percentage of gums than baguettes. Also, we may use acacia powder (a natural pre-biotic and soluble fiber) and citrus pectin to enhance texture and chew. 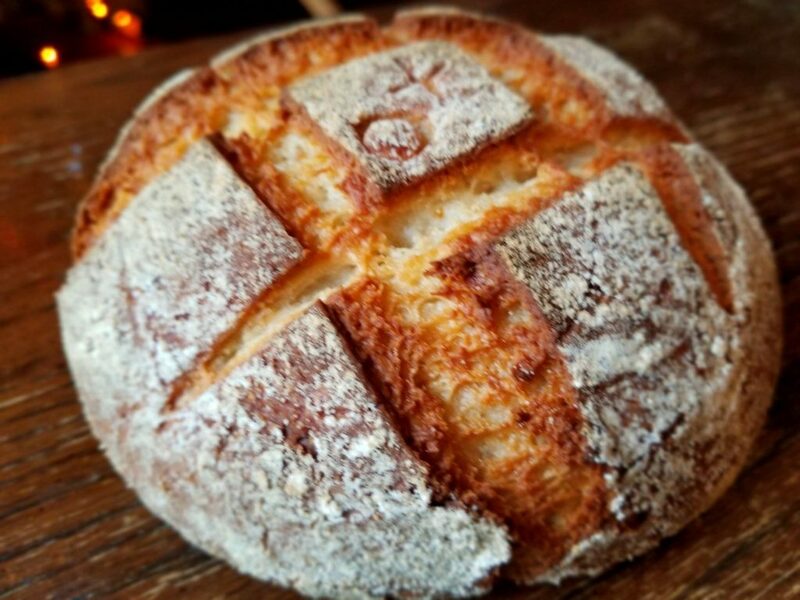 Several bread recipes use Flour Farm as part of our bread flour blend to provide a more delicate crumb. For best results, please follow our posted yeast bread recipes as they are designed specifically to work with Flour Farm. Our bread flour blend can be found by clicking on the link – it is not sold separately at this time. 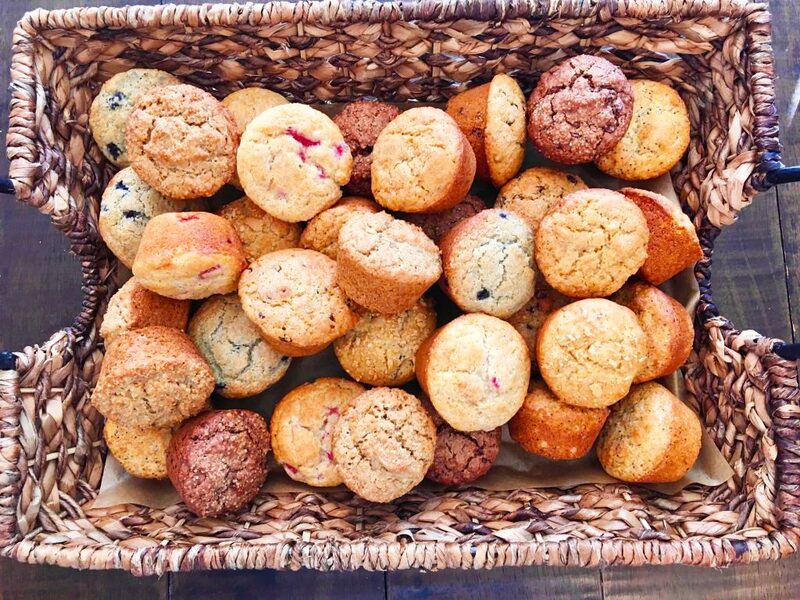 Quick bread recipes, such as muffins, biscuits and banana bread, do not require gums. They rise beautifully without them. The exception to this rule is scones. You may bake scones without xanthan gum, but you will get a bit more rise and tenderness with a very small amount added. We generally substitute 1:1 with quick bread recipes, but adjust the leavening. For example, we will increase the amount of baking powder, or add a small amount of baking soda to a recipe. We will also use an acid such as apple cider vinegar, lemon juice, sour cream or buttermilk. 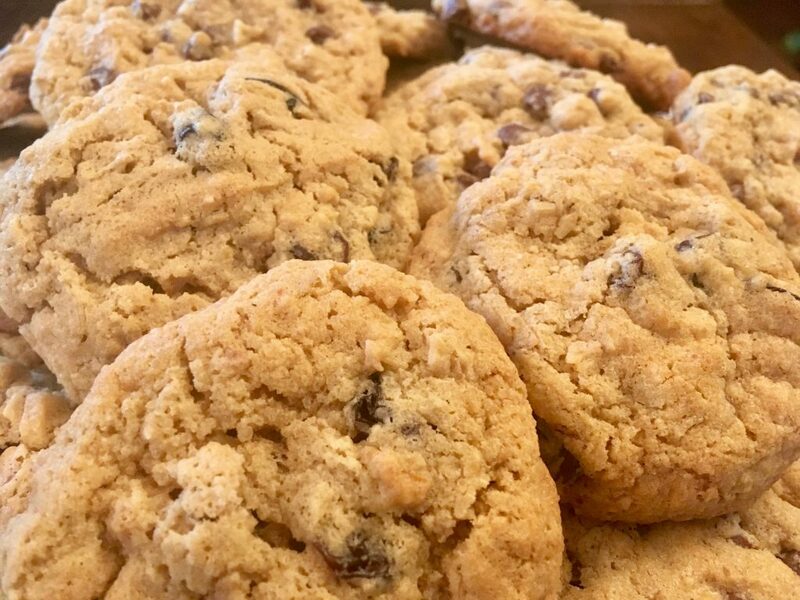 You can substitute 1:1 for drop cookies such as chocolate chip, oatmeal, ginger and nut butter. For biscotti, we also use a 1:1 exchange. 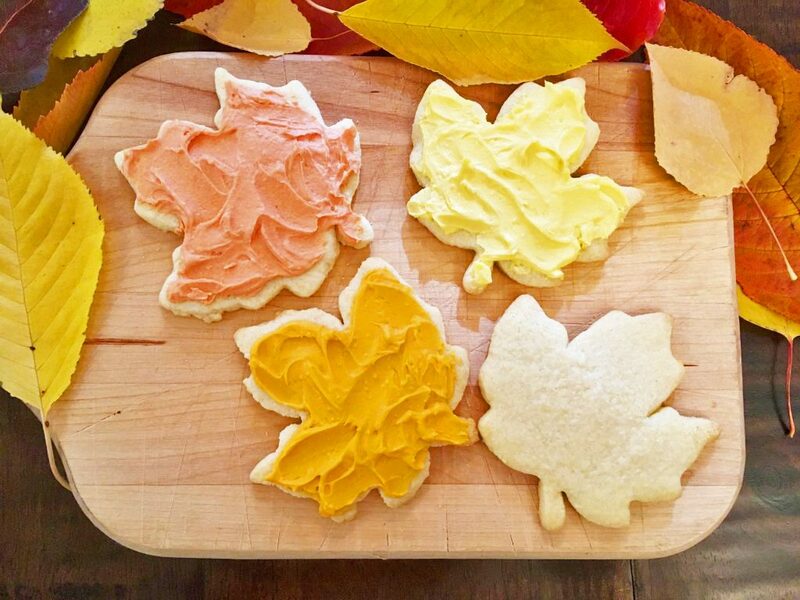 Cut-out cookies, such as sugar cookies, may use a 1:1 substitution. However, the recipe will require a gum in order to roll them out. For our recipe, we add 2% xanthan gum times the weight of Flour Farm. Without a gum, the dough just shreds when we try to roll it out, and doesn’t hold together. We have successfully swapped out all-purpose flour for Flour Farm with these products. However, remember that if any product you attempt to make requires rolling or pressing to maintain form, you will need a gum to keep it all together. The percentage differs by recipe; this is not a one gram fits all scenario. Please refer to posted recipes as a guide. We have successfully substituted Flour Farm 1:1 with many pancake and waffle recipes. An acid, such as lemon juice, and an increase in leavening aid in creating fluffy products. Note: vegan pancakes and waffles require a completely different approach. The coconut flour in Flour Farm traps moisture, which makes using a flax egg or other vegan binder difficult. 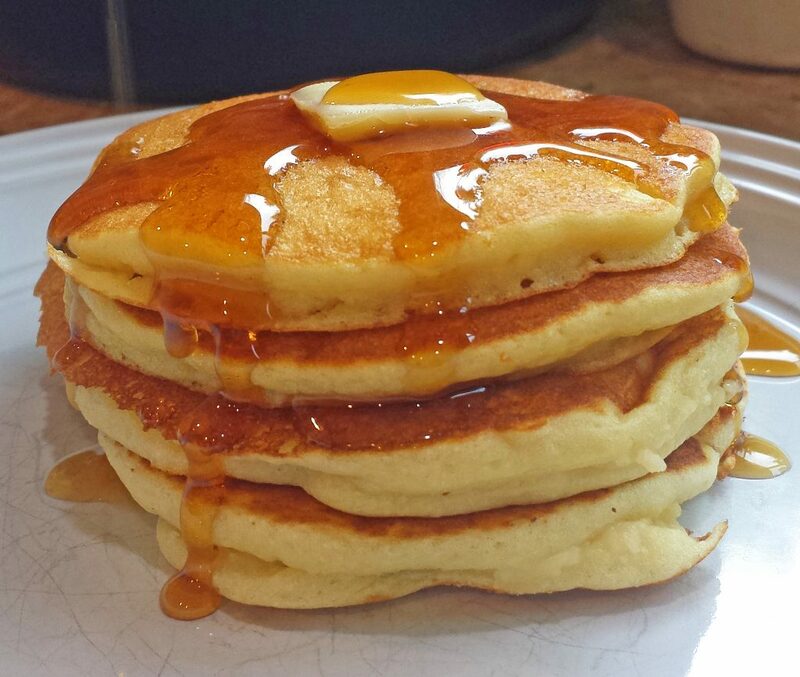 Xanthan gum is your best bet to get the rise and fluff you need without eggs. Please refer to our vegan pancake recipe for success. Cakes and cupcakes use a 1:1 substitution; however, you may need to add a gum and/or fiber to prevent caved in cakes. Our cake recipes with vegetables added, such as with carrot cake, do not need xanthan gum. Our vanilla and chocolate cakes do require it. Please refer to the recipes posted as each requires a different percentage of xanthan gum. We aim to use the minimum amount of gums needed for each recipe posted that requires it. 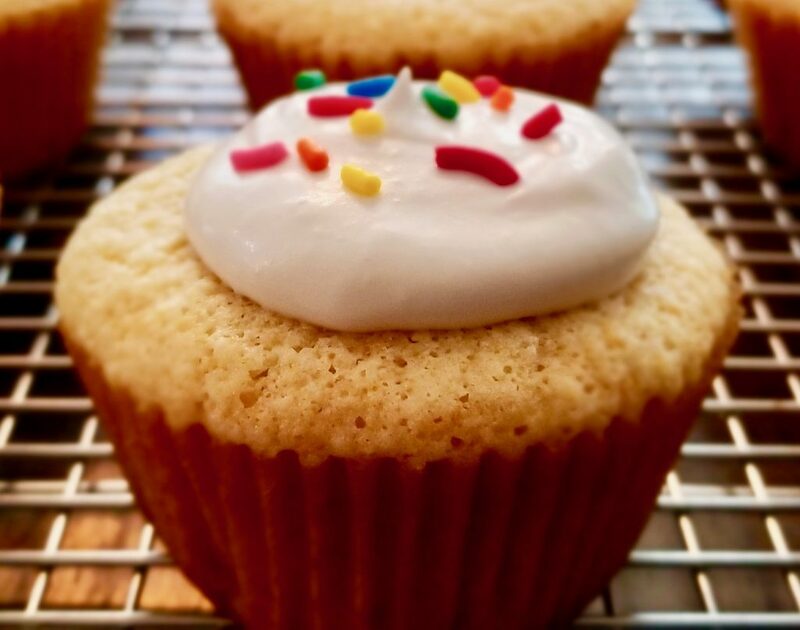 Note: the vanilla cupcake recipe as depicted in the gorgeous picture above does not contain gums. For best results, we suggest that you view the recipes provided as they are designed to taste delicious with Flour Farm. 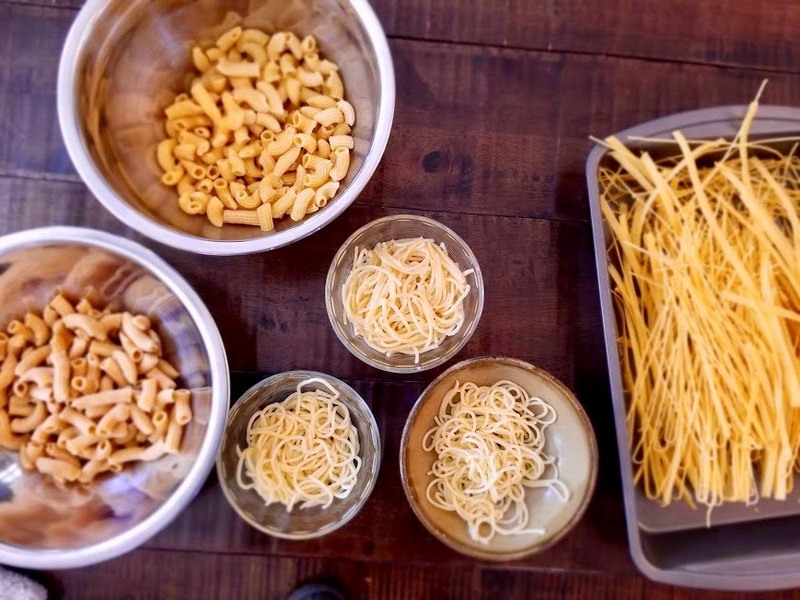 Our pasta is firm, not slimy. Our pizza crust tastes crispy and chewy – just the way pizza should. To sum it all up, many foods that we frequently make such as cookies, muffins, soups and gravies may use a 1:1 replacement with Flour Farm. The more complex a gluten containing food product is to make, the more attention to detail is required. You may need to increase the amount of leavening and liquid, or add gums and acids to get the desired end result. An interesting piece of Flour Farm trivia: only 30% of our recipes require a gum for structure. WOW! That stat rocks socks. FYI: for an extremely informative article on xanthan gum and guar gum, click here. The article is a recent post from 10/18/18. Informed choices set the stage for best choices. If we missed a food type that has you stymied on how to swap, the BEST way to handle that situation is to contact us. We strive to answer every email personally within 12-24 hours. We’re here to help! It takes a village to be successful, and we want you to be happy with your creations. 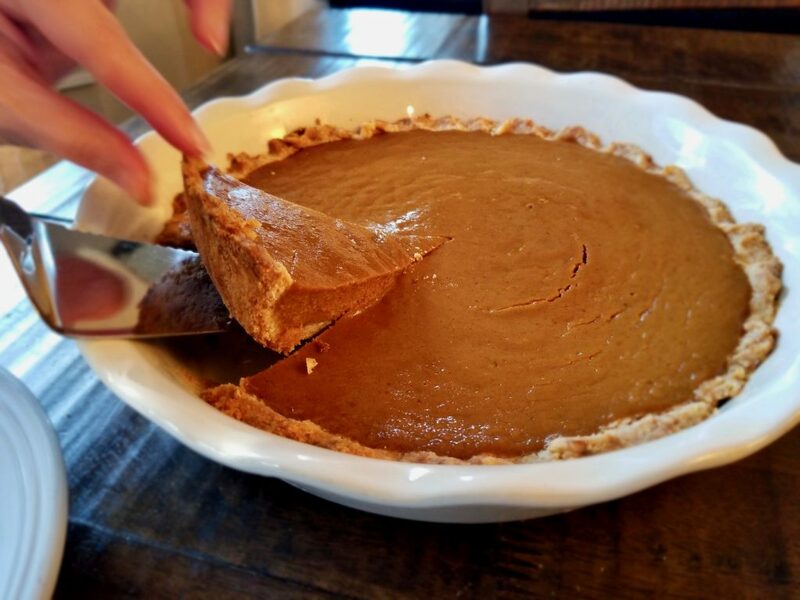 Click on this link to access recipes! Photos by DuPree Productions: Click on each photo to be directed to recipes.